Starting December 16, 2012, this page will be periodically revised for Version 2.04, until it is complete. For quick and precise replies in the Support, or Bug Report Forums, the user should describe the issue in as much detail as possible. A copy of the Support Information is, also, required. Include any additional related information, such as: screen capture/s (e.g., Media Center Master User Interface, File Structure in Windows Explorer), System Information, portions of Log File, guide being used, step number... for the responder to use in order to resolve an issue. "A picture is worth a thousand words." The Support Information is a snap shot of the installation information, current settings used, and internal program version information. When used with additional attachments, these "pictures" give the responder a much clearer image of the issue. They assist in completing the description by filling in gaps, over sites. They also help to identify simple errors, grammar, wrong wording, wrong program function/process names..., used in the description. If a method of attaching an item to a Forum Topic Posting is not listed in the description, a recommended method is listed at the bottom of the page. The "Support Information" is found through the Help Menu-->Support information. The Support Information does not contain any sensitive user information. The "Include log file (last 100 line, if available)" option should be used if there was related information in the activity log window to the issue being posted in the forum. The Application Menu-->Log all output to a file...-->Log to file option must be enabled to include the last 100 lines. The "Copy All" button will copy the System Information to the Windows Operating System clipboard. Be sure to click "Yes" in the pop-up window to format for pasting into the forums. If the option for "Include log file (last 100 line, if available)" is enabled, the last 100 lines of the log file will be included at the bottom of the System Information list. 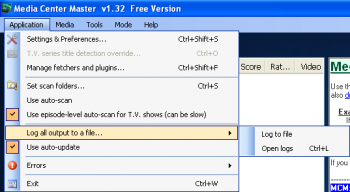 The "Log File" is a text file containing all of the activity done by Media Center Master. 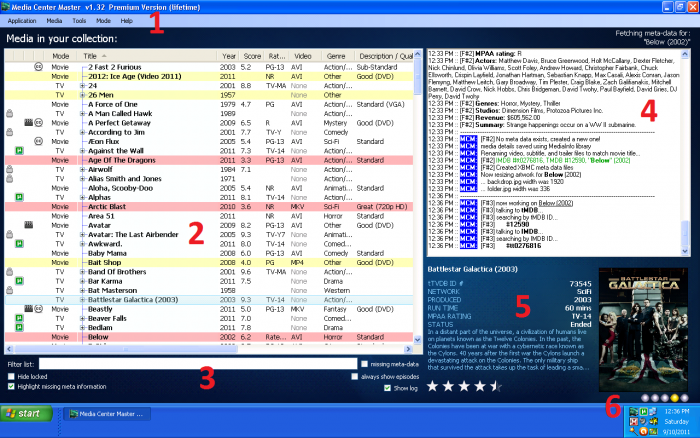 The activity shown in the "Log" window (area #4 in screen capture shown below) is only a portion of what is listed in this file. Portions of the "Log" relating to the issue can be selected from the "Log File" (example shown below). This is needed when the issue is not listed in the last 100 lines, or listed in the Activity Log Window. Enabling the "Log to file" option is required to create the text files named "Activity log for (date).log, and store it in Media Center Master's hidden user folder. 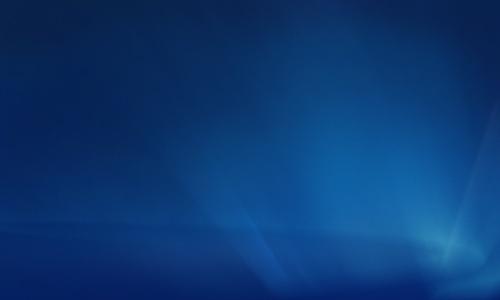 Media Center Master will create a new log file at the beginning of each day at 12:00 a.m.
Accessing the "Log File," and the option to enable the creation of a log file is found through the "Application Menu -> Log all output to a file..."
An example view of the hidden folder location in Windows XP. Developer - level debug messaging provides a deeper level of logging for determining the cause creating a problem. The messaging is enabled by the user, and is viewed in the log window. It will also be listed in the log text file, if the Application Menu>Log all output to a file...>Log to file option is enabled. 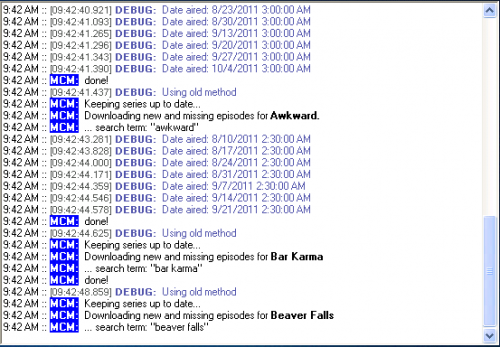 When a user is seeking assistance through the forum involving certain circumstances, Pete will respond, and will ask the user to turn on debugging and supply a portion of the "Log Viewing Pane," or the "Log File" with debug messaging. Debug messaging is enabled through the Help Menu>Debug...>Show developer-level debug messaging option. An example of Debug messaging in log window. 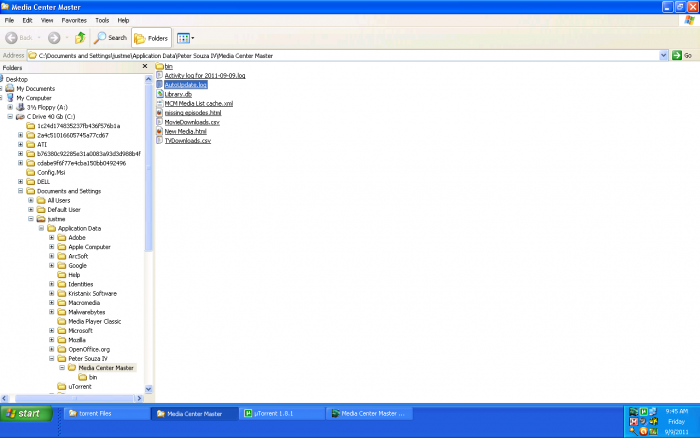 The "Auto-update Log File" is a text file containing a log of the auto-update process. It is not viewable in the "Log Viewing Pane" in that the processing is done before the user interface is opened. Should a user need assistance with an auto-update problem and post a topic in the forum, this log file can be used by Pete to assist the user in resolving the problem. Enabling the "Log auto-update attempts to disk" option will allow Media Center Master to create a text file named, AutoUpdate.log, and store it in Media Center Master's hidden user folder. 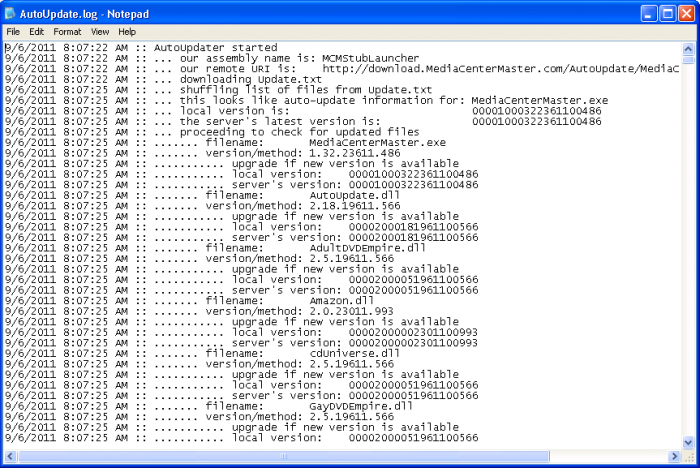 Media Center Master will only create one auto-update log file, and will continue to add logging information to the one file. An example of an AutoUpdate.log file. 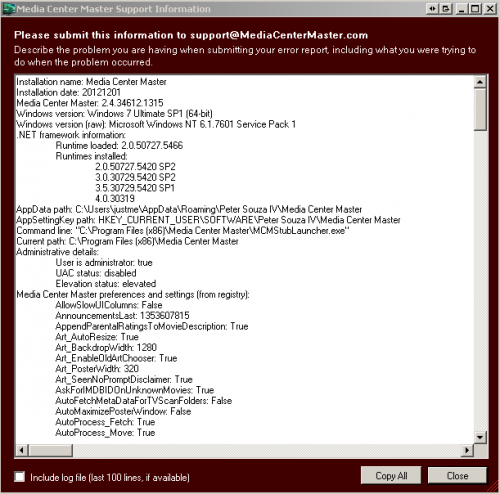 About is a pop-up that contains basic program information for the installation of Media Center Master. The "About" pop-up is found through: Help Menu>About. An example of "About" pop-up. 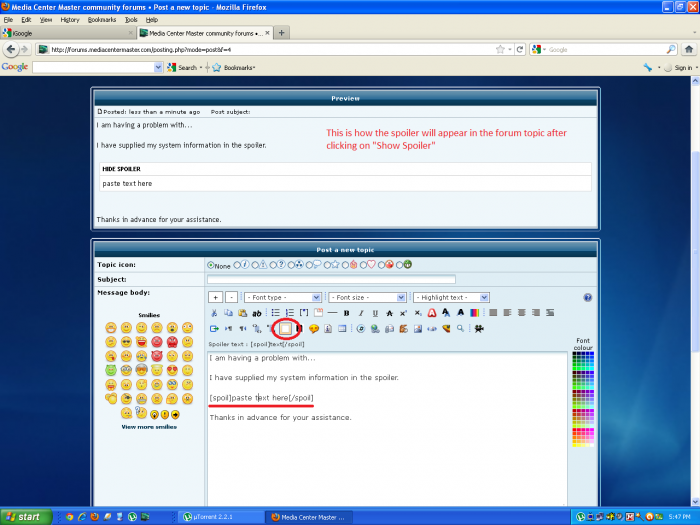 After Support Information has been copied, or Log information has been selected and copied, the contents of the clipboard can be pasted into a forum topic message as "Spoiler Text." In a forum topic posting, click on the "Spoiler Text" icon (white square), located above the message window, then paste the contents into the spoiler.